These days, both here and abroad, modern buses (and light rail units) are looking more and more like shoe boxes and/or giant mutated caterpillars/eels than buses. I was gonna have made the comparison of today's buses in their appearance to milk cartons. I remember back in school days old milk cartons were actually used by students to make replicas of buses. Wonder how many of those grew up to be in charge of, or at least be involved in, current bus design. The newest buses I CANNOT stand are the ones that imitate Light Rail unit styling, and end up looking like a giant insect larvae.....COMPLETE with ANNTENAES!!!!!!!!! I have seen some pics showing the newest artics in some cities that make me want to grab the RAID!!!!!!!!!!!!!!!!!!!!!!!!!!!! The New Look, though startling and modernistic when it debuted in 1959, was ATTRACTIVE and STYLISH and MODERN and did NOT look like a giant shoe box or a people-hungry mutated insect!! Located at Academy in N.J. Compliments of Traildriver. There's also one photo showing a gutted New Look (cannot tell what company once rostered it), with a lopsided SOMERSET Old Look just behind. Another bus I snapped was an ex-PSNJ Old Look (a 4512?) that was clearly OOS; it was still painted in PS's two-tone green. Queens Transit/Queens Surface had a New Look bus with square windows. An "indy" operator on the old NHBL #1 (JSQ-Nungessers) had such a coach back in the early/mid- 90's; I rode it several times, but never got to take any pictures. In 1984 NYBS received 3 GM Classics, numbered 1600-1602. These were basically the late version of the Fishbowl. I remember a picture of a body with the other nose. The wild part about this 3 bus order was they all had different engines. I believe 1600 had the DD 6V92TA, 1601 had the DD 6V71TA and 1602 had the DD 6V71. If I am wrong, then 1602 had the 92 and 1600 had the 71. 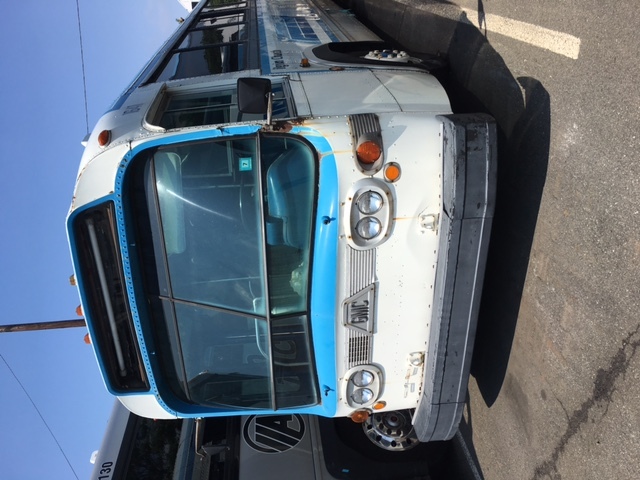 As you can see, built by GMDD before the design was sold to MCI, which built the 1988 and 1989 Classics for NYCDOT. You absolutely could see the difference in quality. Those GM Old and New Look suburbans were INDEED "Joisey Buses"! I recall thinking the new NJT RTS were quite "exotic" when they started arriving in 1997; I had ridden then on the MBTA in Boston. Today, NJT's RTS/NOVA coaches are gone, as are the once-commonplace METROs. NJT's EAGLES seemed to disappear almost overnight; I had planned to ride one some day, but never got around to doing so.